Where did October go? I forgot to show you our house building progress from 3 years ago. 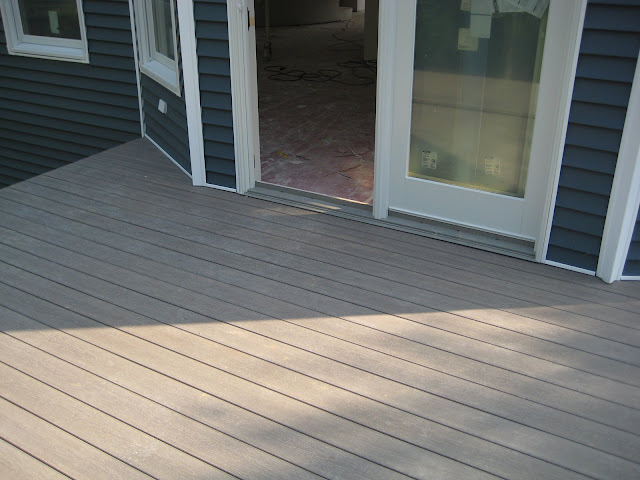 We installed the floor of the deck. We used the Ultra Deck system. We have been very happy with this decking system. The only maintenance needed is a good power washing once a year. The walls got paint and trim! (Please see our House Tour page for paint colors!) This was such an exciting time. The house came to life. We enlisted the help of some family and got to work. We think it took about 2 full week-ends to finish all of the painting. We don’t remember for sure though. We try to block out this part of our lives. I’m not sure why we didn’t keep the tub in the middle of the bedroom floor. Please excuse my husband’s rear. This stair assistant still freaks me out. It lives in our basement and haunts me. Cabinets were installed in the office at the end of the month..
We also had tile installed. We didn’t do the tile ourselves. It is the one DIY project that we could have tackled but we were running short on time. It was either spend the next 4 week-ends tiling or have the flooring company do it in 2 days. We went with 2 days. We do not regret this decision. Phew. We were busy in October. It’s so weird looking back. It seems like yesterday but 10 years ago at the same time. Be sure to check the rest of our building process here!